The Wisconsin Historical Society on a beautiful Saturday morning! 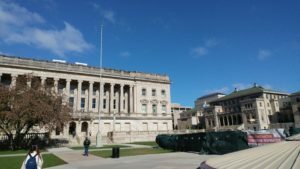 On Saturday May 6th, I had the opportunity to attend the Italian Genealogy Workshop at the Wisconsin Historical Society. These workshops have helped shape me into the genealogist that I am today by learning from master genealogists traveling from around the country to present at the University of Wisconsin. In the past, I have only gone to presentations that pertained to my ancestry or my husband’s, but this presentation was outside of my realm of experience and therefore, I was able to look at it with new eyes and ears. The day-long conference was presented by Dr. John P. Colletta, who is a professor at the Smithsonian and has taught copious amounts of genealogical classes. He presented four lectures: a general informative lecture on immigration to America, how to trace families back to Italy, how to explore Italian records, and research techniques. He prefaced the presentation by saying that these techniques could be used for many ethnicities. I learned a number of things throughout the day, but I wanted to present a few of the highlights that gave me wonderful insight. Dr. Colletta came with enough information that could have been spread out over a three-day presentation, but he only had time for one. He was funny, smart, and knew his material so well that he could go along with where the audience’s questions took him. And if there was a tangent that he wanted to go on, he would say that he wished he had time to go into it more indepth and moved on, but for me, that really encouraged me to look into the matter on my own time! The handouts that he provided were one-page of outline and pages of bibliography. My handouts are covered in red from the amounts of notes that I quickly scribbled down. The bibliographies, one titled “Lamentably Select Bibliography” and another titled “A Pitifully Select Representative Bibliography,” revealed just a small portion of this man’s internal library. It captures the humor that brought this information and presentation to life! 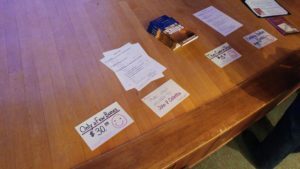 Dr. Colletta’s little book sale at the workshop. Complete with smiley faces! And the books that were for sale were reasonably priced, ranging from $19-$30. Unless if you wanted his autograph, bumping the price up to $3,700. Fortunately he signed my two purchases for the regular retail price! It will be worth millions in a few years! And it also helped that he spoke a little Italian, so bouncing back and forth between a New York accent to an Italian accent was really something! This topic came up in regards to Italian history. The country of Italy itself is rather young as it was made up of different houses, kingdoms, and the Papal States. Dr. Colletta noted that each region had–and still does–its own traditions, styles of writing, food, clothing, etc. I have found this to be good advice especially while working on German and Prussian ancestry. The boundaries have changed through wars and treaties and with the borders come changes in names, record repositories, and the blending of traditions. And just how there are towns that have the same name through the United States, the same situation can be found in Germany and Poland. Thankfully the Meyers Gazetteer can help out with that! But I also applied this to my own ancestral lines. What kind of Irish am I? What kind of Norwegian am I? I think that it is best to gain a good overview of the entire country, but what is the most relevant to my ancestors? What happened in their region that made them leave for America? Census records are one of the first types of records that I learned how to use in genealogical research, but there is so much more to learn about the information that is found in one family’s listing. Each year’s census records kept some of the questions from the previous one, but some questions were added to reflect what was important at the time. In the late 1800s, the United States Federal Census began asking what language each person in the household spoke. Often times, the head of the household and the children spoke English, but the women did not necessarily have to speak the new language. Men and children were in situations where they worked alongside people from other origins and English was the third point in the triangle to make the connection between the two or more conversants. Dr. Colletta pointed out that women–especially Italian women–spent the majority of their time at home. If the women went out, they went to the grocer to pick up food or to run another errand. Families that lived in an ethnic neighborhood that reflects their original ethnicity were able to speak their native language if they chose. One thing that I learned from my husband’s grandfather was that his parents did not want him to speak the Czech language and instead expected him to only speak English. He heard Czech spoken in the house among the adults, but they spoke to their own children in English. I feel that there is a great loss when the language is not passed down from one generation to another. I understand that assimilation is the main factor in this process, but language helps with identity and losing that tradition is a hard one to gain back in future generations. Overall, Dr. Colletta was a wonderful presenter who was full of knowledge! Fortunately, I was able to purchase two of his books and I cannot wait to read them to learn more!